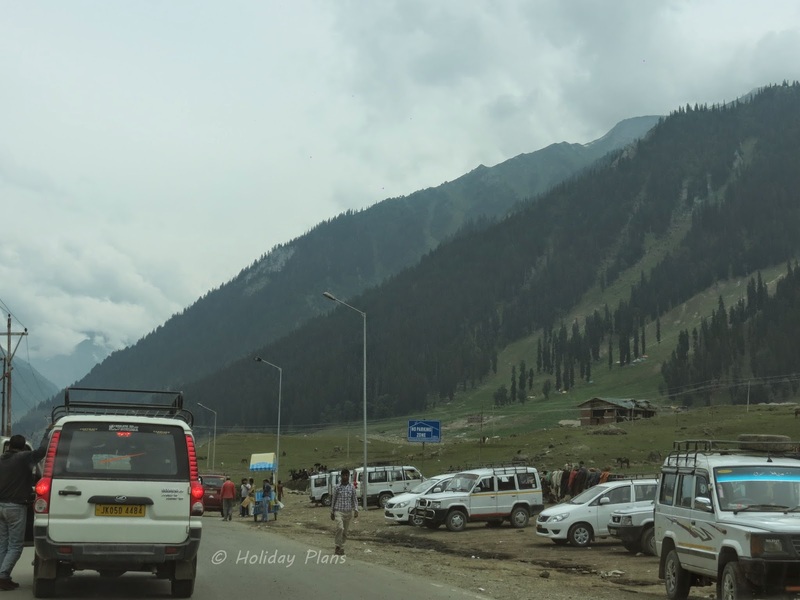 After having a yummy breakfast at “Princer da dhabha”, we started our journey from Srinagar to Kargil. We said goodbye to Dal Lake as we moved towards Kargil, on the National Highway 1D (also known as Srinagar- Leh Highway). We had a brief stopover at a point called Sindh Point. Sindh, the largest tributary of Jhelum River flows nearby and Kashmir Mountains could be seen from here. So, get yourself ready to be captured in this beautiful background. Sindh River will accompany you for most part of your journey. You will also see army tanks passing by very frequently. At one of the places we also saw an army training going on. 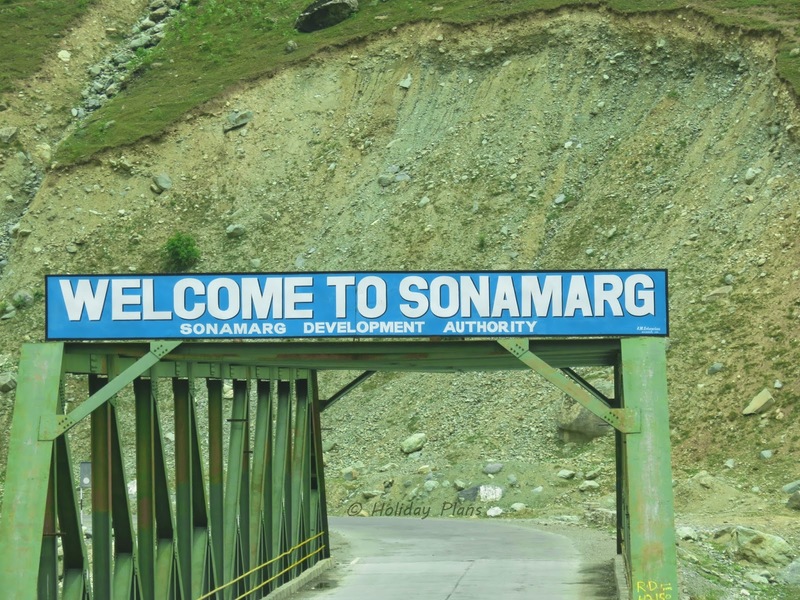 As we continued our journey through the green valleys of Kashmir we were welcomed by a board reading “WELCOME TO SONAMARG”. 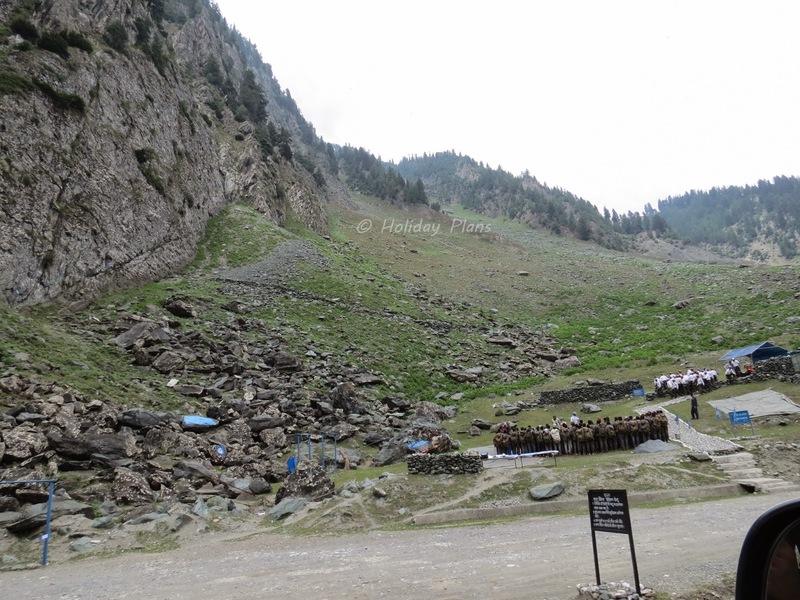 Sonamarg, popularly known as Meadow of Gold is a popular hill station in Ganderbal district of Jammu and Kashmir. 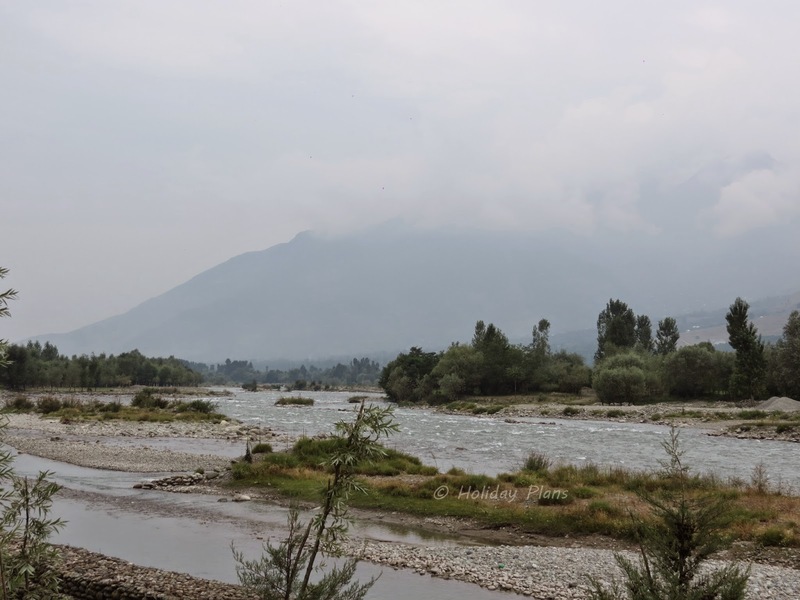 The place is 87 kms away from Srinagar and is worth visiting and stopping by. You will not find much snow at lower levels in the month of August, but you can go up to Thajiwas glacier to have some fun. There are separate vehicles for going there and will normally take 4-5 hours for the complete journey. If you are stopped at any point on your way by the police, tell them that you are going to “Fish point” (Even I don’t know what that is!!!). We stopped by at Children Point, a perfect picnic spot for the tourists. The entry fees of this place is Rs 10. We got a few pictures clicked in the beautiful backdrop of the waterfalls and the hills. We savoured upon Maggi there, which costed us a whopping Rs 50 per plate. 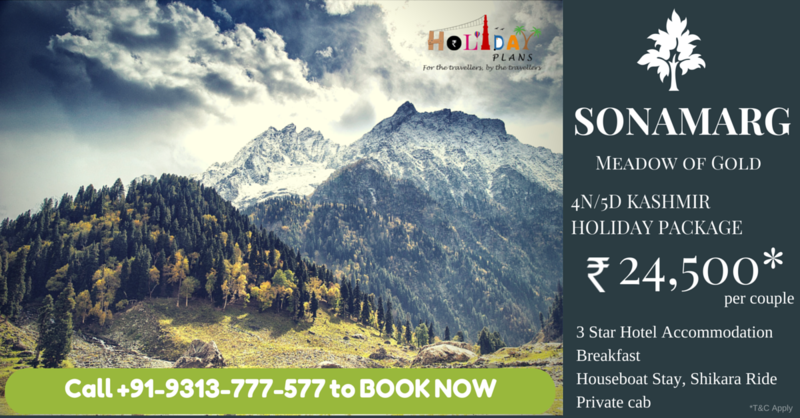 As we continued our journey, we saw huge mountains which were so beautiful and picturesque that we felt like “Yaar pack karke ghar le chalo is sab ko”. But then you only have a camera to capture this scenic beauty.You can see snow covered peaks of mountains and clouds playing hide and seek with them. The next check point, Dras is about 120 kms from here. 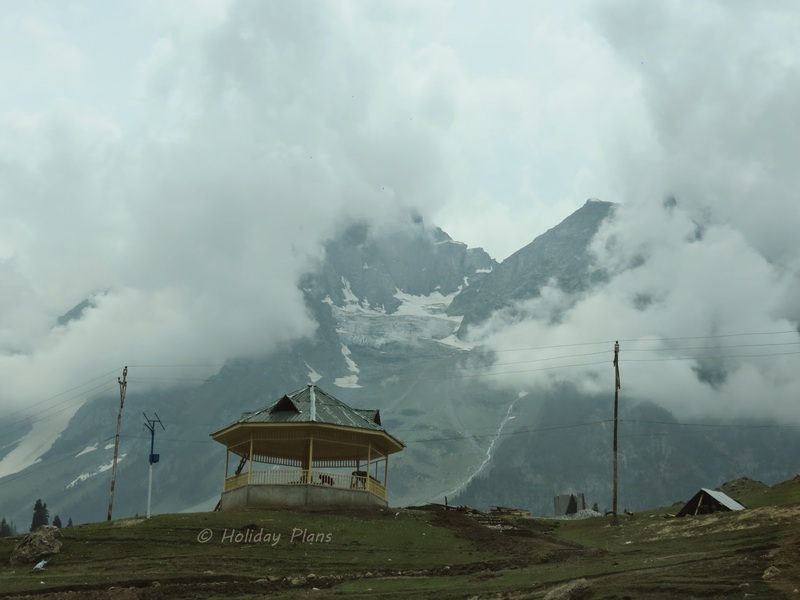 A route to Baltal for journey to Amarnath cuts in between. 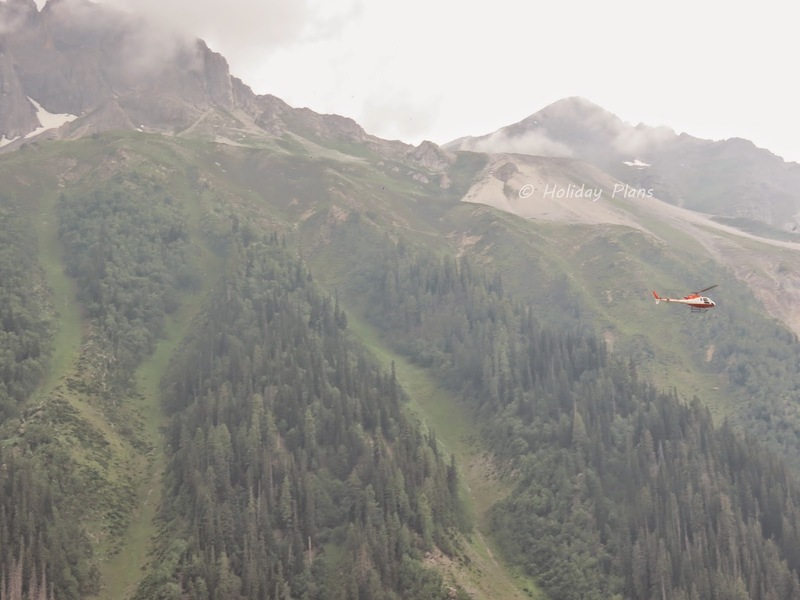 One can see helicopters frequently flying and taking pilgrims from Neelgrath to Panchtarni . The moment we entered Zoji La Pass, the journey became tougher and adventurous- rough terrain; with beautiful scenes all around. The traffic is one way only and there can be frequent stops in between to allow traffic from other side to pass. Coupled with the bad condition of roads, the time for these stops can vary from few minutes to long hours. Meanwhile, one can just enjoy the weather and scenic beauty of the valley. One can also find (dirty) snow around to play with. The weather was getting cold which made us don our woollens. 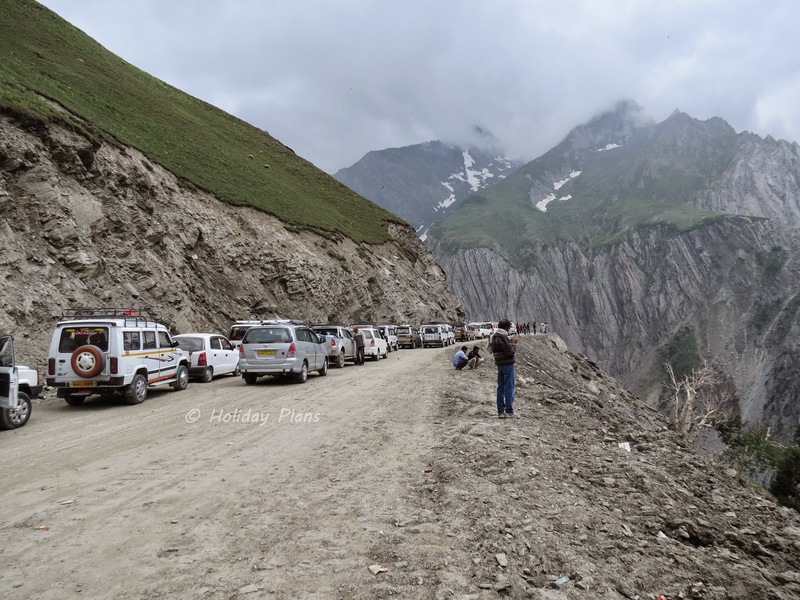 As soon as the road opens, the long queues of waiting cars start rushing and you feel to be a part of a big Karvaaaan! 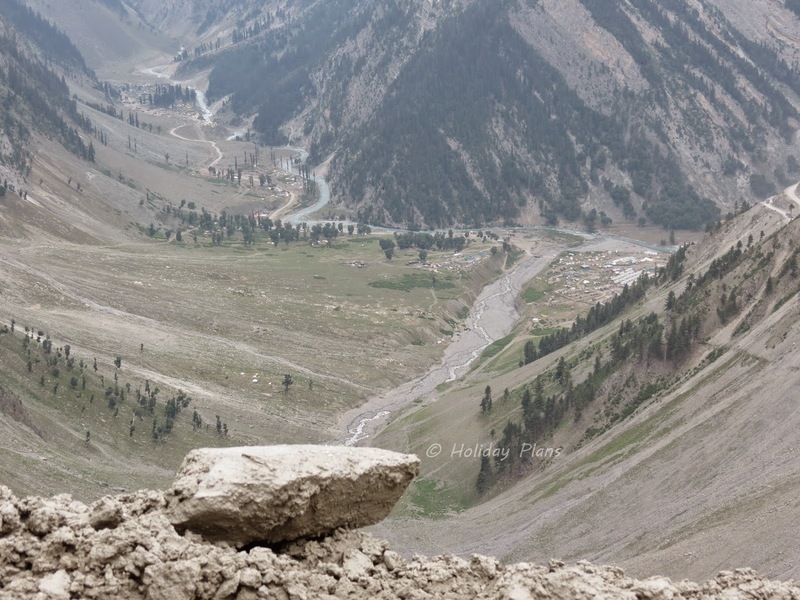 After we crossed Zoji La pass, the driver told us about a point – Zero Point. We felt it was too much over hyped in the month of August (you may find enough snow in the months of May- June), so we just had a glance of that place while passing by. After some distance we were welcomed by a board “WELCOME TO LADAKH REGION”. The landscape of the region drastically changes after this point. Shepard and a fleet of sheep jammed our way. 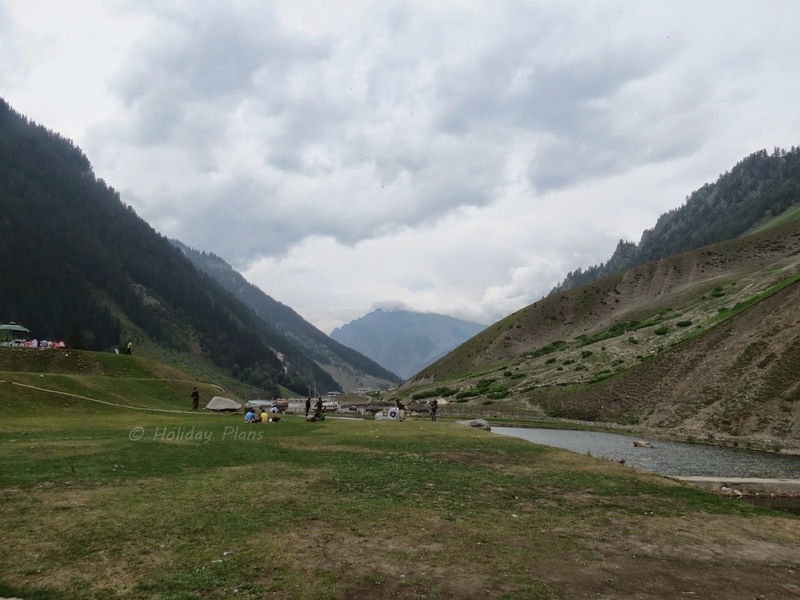 Bid adieu to green mountains and say “Hi” to dusty brown mountains which in the clear blue sky will make you fall in love with the place at the very first sight. Just before entering Dras, there was a check post where our car was stopped and our identity cards were verified by army men. 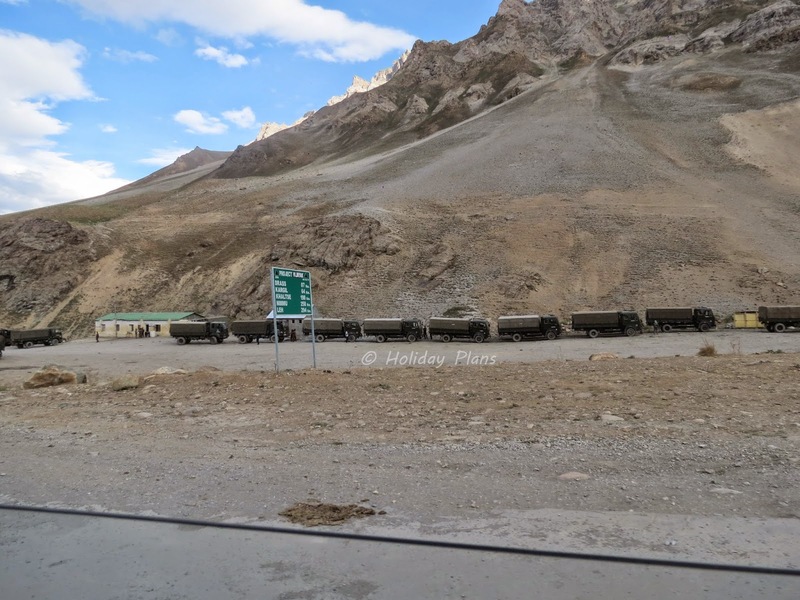 After this check post we entered Dras, a town in Kargil district of Jammu & Kashmir and often referred to as “Gateway to Ladakh”. After crossing the market and residential area we were greeted by the famous peaks of Tiger Hill and Tololing- where 1999 Kargil war was fought. 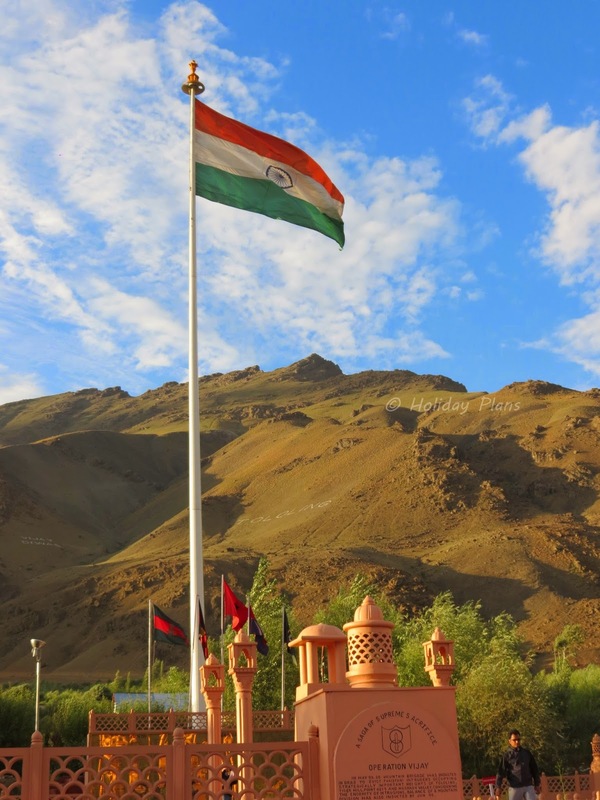 Dras has a Kargil war memorial by the name of Operation Vijay memorial which infilled us with patriotism and respect for our brave Indian army men who guard Indian borders- irrespective of any weather. Thus this place is a must visit for every tourist passing by. Quick fact: Dras is the world’s second coldest inhabitant place where temperature had dropped to as low as " -62 degree Celsius" ! 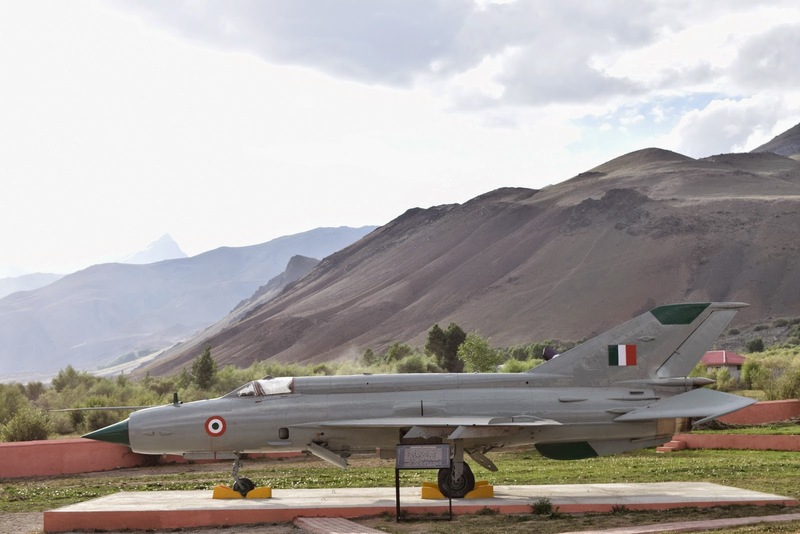 The war memorial will take you back to 1999 giving details of the Kargil war. The two letters at the entrance were worth reading (photos of the letters in Gallery). Talk to the army men posted there and they will share their lifetime experience and Kargil war with you. A massive tricolour in the middle of memorial with an “Amar Jawaan Jyoti” completes the picture. There is a canteen at the memorial which serves very tasty food at nominal rates to fill up your hungry stomachs. As the sun was setting down, the sky and clouds played around to give some of the most beautiful pictures apt to adorn your laptops in the form of wallpapers. We saw Indian flag taken down as sun sets. Till the time we reached Kargil, it was already dark there. It is totally safe to travel in night at this route. 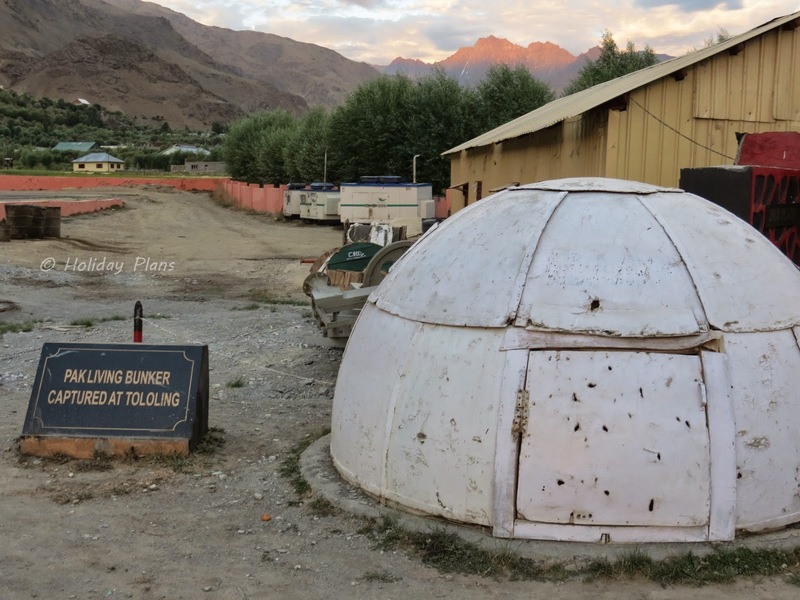 We took a halt at a small town in Kargil for one night. 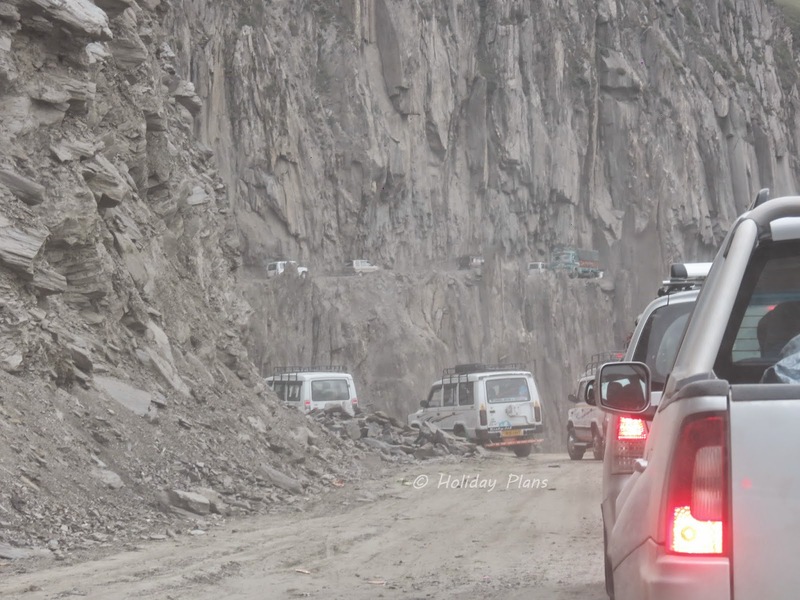 We decided to continue with our journey to Leh from the next morning. PS: For all those who feel AMS (Acute Mountain Sickness) should carry medicines with them. Diamox speeds up acclimatization process and helps prevent AMS. To book a customised tour to Jammu and Kashmir/ Ladakh, feel free to get in touch with us. Get your soulmate to this beautiful paradise on Earth. Special arrangements for honeymoon available. Oh Yes! Perfect place to see the bravehearts! Thank you for posting such a beautiful article. Janni janmbhumi swargadpi gariyasi. The visit here will not only make you feel like heaven, but will also develop a patriotic feeling. Get the 'FEEL PROUD' factor installed in you. Agar Firdaus bar ru-e-zamin ast, Hami ast o- hami ast o- hami ast. Ohh amm gee!! This is lyk d best article dat i have read in my lyf!! This is d most heart warming n pleasant article about Kargil!! How can someone write such a perfect English!! Feeling if national pride reinstalled!! All because of author!! I wish i could meet him in person!! @Ayush : Thanks for stopping by and read our experience. 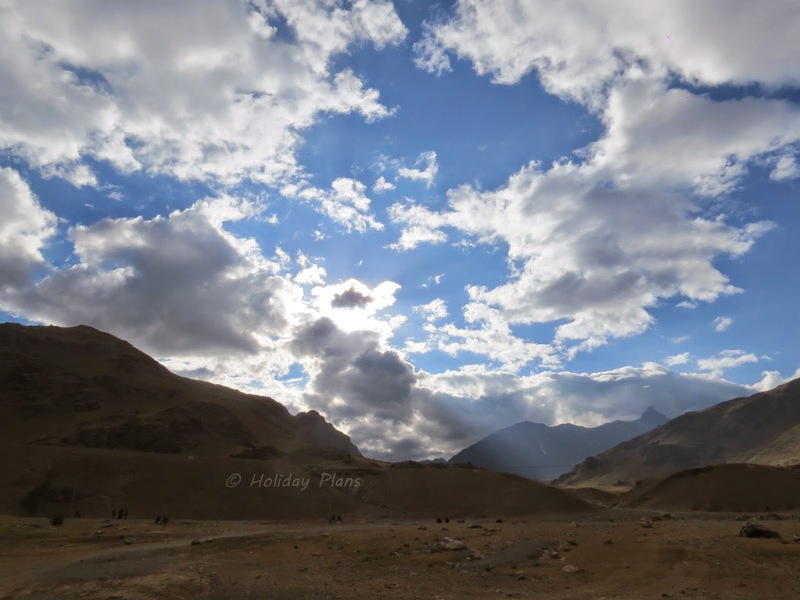 We will share more of our travel experience of Kargil and Leh. 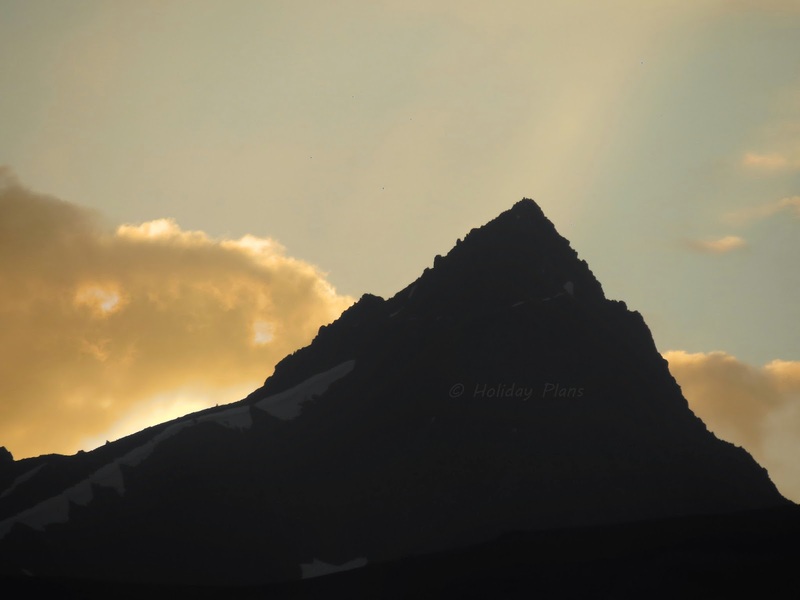 @Himanak : Thanks for reading our travel experience. Do share your experience also. @Sarthak : Yes, you are absolutely right..the place truly brings in the patriotic feeling in you. @Shubhopriyo : Rightly said "Agar Dharti par kahin zannat hai to bas yahun hai yahin hai"
@Ayushmaan : Thanks for stopping by and reading our experience about Kargil. Indeed the place reinstalls the patriotic feeling in you. Stay hooked up for more articles and keep sharing your feelings.